David Carton, one of fotoLibra’s valued contributors, has uploaded some of his images to specialist ecommerce sites as well as to fotoLibra. Recently he was informed by one of these sites that they were removing one of his images, as the “rightful owner” of the image had sent them a Take-Down notice. 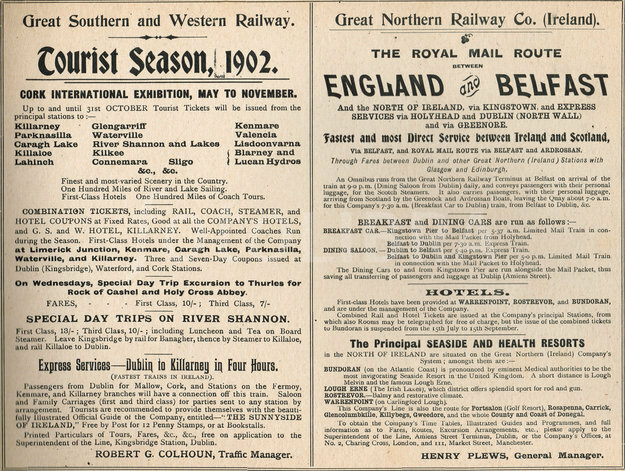 Carton was puzzled as to who this “rightful owner” could be as the image (shown below) was a scan of a 1902 ad for the long defunct Great Northern Railway in Ireland, and not attributed to any artist. Naturally he asked for the Rightful Owner’s name. It was the Universal Music Group, claiming copyright on the image. Why? UMG had done a search for GNR and issued take down notices for every image they could find which had GNR in the keywords. The Great Northern Railway (Ireland), the subject of Carton’s image, does not appear high on the Google search list because it closed down in 1958. But Guns N’ Roses do, and their agents UMG have sedulously trawled the internet to ensure the world ceases and desists from making even the tiniest profit through any association with the group. Their tsunami of threats has flooded to encompass the poor old Great Northern Railway (Ireland), defunct before the Guns N’ Roses singer was even born. Oh, please. These guys simply caved in under corporate bullying. Carton let the matter drop, and the image is now freely available on the fotoLibra site. So now Mr Rose of the Guns N’ Roses beat combo can breathe a sigh of relief that his pockets aren’t being pilfered and go back to being a milkshake duck. You Might As Well Jump. Or was that someone else?